How do I setup a transfer to/from Gatehub with FlashFX? 2. When FlashFX receives your funds, you will be notified via email. Now you are ready to transfer. 3. Select “send” from the dropdown menu on the user dashboard. Enter the amount of AUD you would like to have transferred. FlashFX will show you an estimated USD or EUR amount based on the expected exchange rate and total notional you are looking to transfer. Clicking “continue” does not confirm your transaction, you will still have time to verify all the information before sending. 4. Tick “Send to Ripple Address” at the top of the payment details screen. Enter the Gatehub issuing address: rhub8VRN55s94qWKDv6jmDy1pUykJzF3wq. Leave the destination tag blank. Before you can transfer money to your Ripple wallet on Gatehub it must be activated with 20 XRP. Ripple wallets can be activated via services like Bithomp or Changelly (note: FlashFX does not endorse or guarantee the performance of this website). Be aware that Gatehub ripple wallets demand a minimum reserve of XRP that cannot be withdrawn. Once your wallet is activated you will need to set a trustline. Your wallet must trust the Gatehub issuing address rhub8VRN55s94qWKDv6jmDy1pUykJzF3wq before it can receieve EUR or USD Gatehub. You do not need to establish any trustline with FlashFX. This is how we recognise that the funds in our Ripple wallet have come from you. 2. Input the amount of money you are looking to convert and in what currency. If you are sending from Gatehub you will be requesting a USD or EUR → AUD transfer. Clicking “continue” does not confirm your transaction. You will confirm your conversion rate later, once your funds have arrived in FlashFX’s Ripple wallet. 3. Provide details for the person who is sending the money. If you are the sender, enter your personal details here. Make sure to tick the “Sending from a Ripple Address”. Gatehub will calculate the in-Ripple fees for you (0.2%) on this page. For example, if you wanted to withdrawal $100 USD Gatehub will charge your account $100.20. 6. 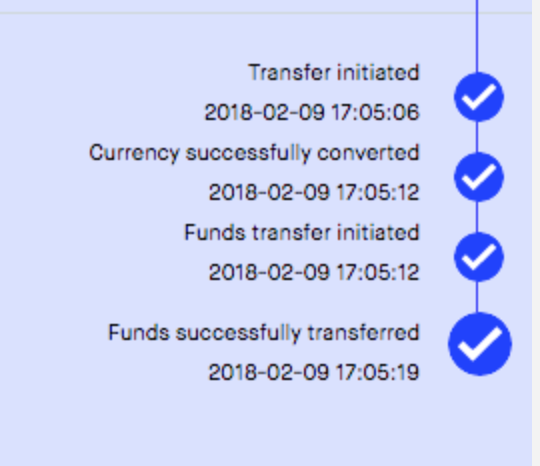 Once the funds have arrived in FlashFX’s wallet and have been processed you will receive an email. 7. Log on and confirm the final exchange rate. Then designate the bank account for the deposit. The bank account name must match the name on your FlashFX account, otherwise there may be processing delays.